They say I have a wicked heart murmur. When the doctor puts the stethoscope to his ear he hears an extra whooshing sound between the heartbeats. I can't hear these extra heart sounds that are a result of turbulent blood flow, but the ongoing murmur is detected every time I am examined. Although heart murmurs are not always a major problem, it's obviously not the way the heart is meant to sound. Unfortunately, in my case, there is a concern and my cardiologist has taken a watch and wait approach to see how to best handle my heart. It's not only my physical heart, but my spiritual heart is defective and wicked. 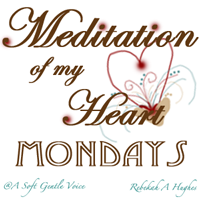 I've been given a new heart, but the murmurings that are too often heard are a result of the turbulence deep within. I'm ashamed about the way I whip my tongue out and slash with my words and how it hurts those nearest to me. The struggle within is heard without a stethoscope and at times those closest to me take a watch and wait approach to determine how to best handle this raging fire. "I love God’s law with all my heart. This power makes me a slave to the sin that is still within me." It's only the first Monday on the threshold of the new year and you may be already wondering how you'll get through your day. How many biting words before breakfast? How many mumblings before morning coffee? Let's stop before we go any further, shall we? We won't be taming any tongues on our own. "Oh, what a miserable person I am! Thanks be to God through Jesus Christ our Lord!" The answer is The Word that became flesh. We are utterly dependent on the work of God in our inner being to transform us into His likeness. By the grace of God, and the work Christ has accomplished, we are washed. May our prayer this day, yes, even every day this year be like the Psalmist. That our words and our mediations would be an acceptable and sweet offering. That the sound of our hearts would beat in time to the steady beat of God's heart. The Word of God is living and active. It's not mere words meant only to be read. It's meant to reveal to us what is in our hearts. So this is how we should handle the sharpest double-edged sword that has the power to pierce as far as the division of soul and spirit. As the murmurs of our hearts beat in rhythm to God's and our hearts are purified the words of our mouths will drip pleasant like honey. Make your heart a storehouse for the riches of the Words of God that they might get into your soul that you might never forget them. We need not only read His Holy Words, but we must memorize them. We need His message to be clear in our minds and our hearts. Literally murmur it, turn these precious words over in your thoughts. It's not a clearing of the mind, but a cleansing with the words the very water washing over our thoughts. Mutter the words over and over. Muse about God's Word to yourself. Contemplate His Words and deeds. And offer it up as an offering to your Redeemer. What has been the meditation of your heart today? And how has it helped the words of your mouth be sweet? "It's not mere words meant only to be read. It's meant to reveal to us what is in our hearts." I sweet friend I love this! First, I will be praying for you and praying for the doctors who watch over you and your heart. As I seek to improve my morning time with God this year, I'm grateful for your words today. Joining you in praying... That our words and our mediations would be an acceptable and sweet offering. That the sound of our hearts would beat in time to the steady beat of God's heart." "As the murmurs of our hearts beat in rhythm to God's and our hearts are purified the words of our mouths will drip pleasant like honey." Oh, I love this! What a beautiful description on what holding God's word deep in our hearts really means! Thank you for linking up and I hope you will continue to bring these inspirations of hope to others. Thank you for your loving and gracious comment, Angie. It was a pleasure to link up with you!